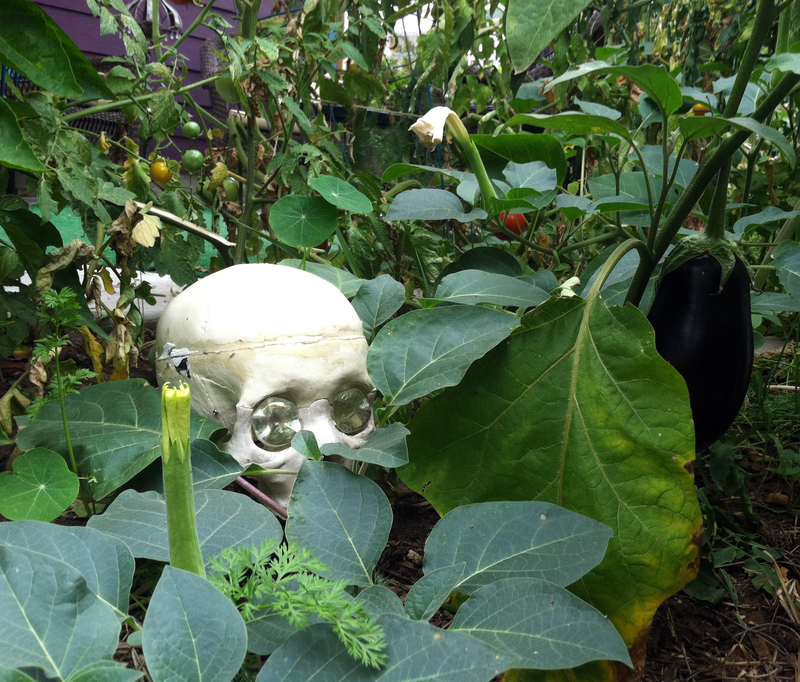 This week we’ll be wandering around someone else’s garden. 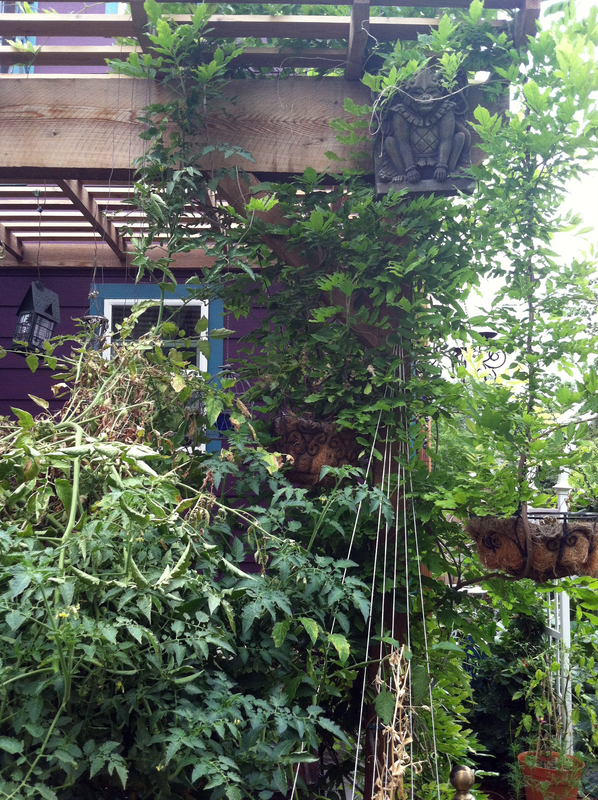 This wacky & wonderful garden is chock full of fun and unusual ideas using found objects, leftovers, chickens and more. 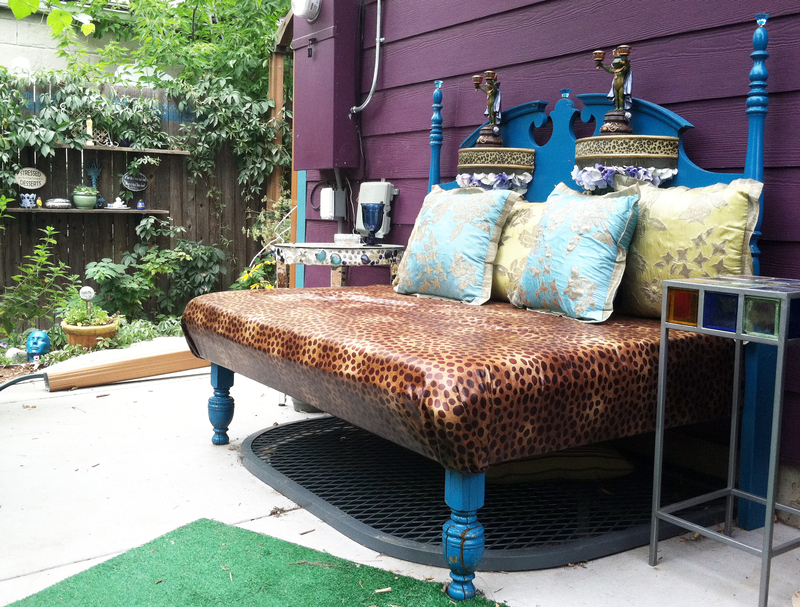 This creative space belongs to mask-maker Tiffany Smyth of Denver. If you don’t know Tiffany’s masks, you need to http://www.artsmyths.com Once you see the masks, you’ll understand the garden. 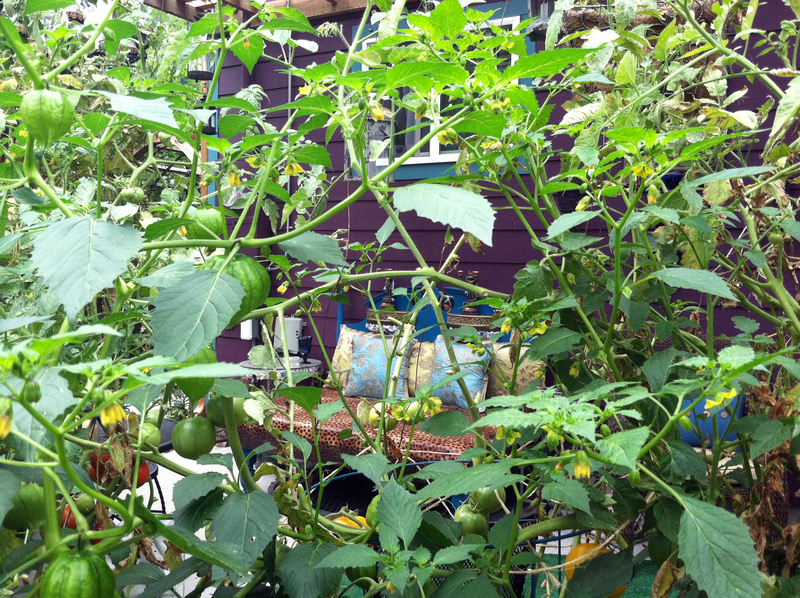 I’ll be covering this garden in 3 blog posts this week. 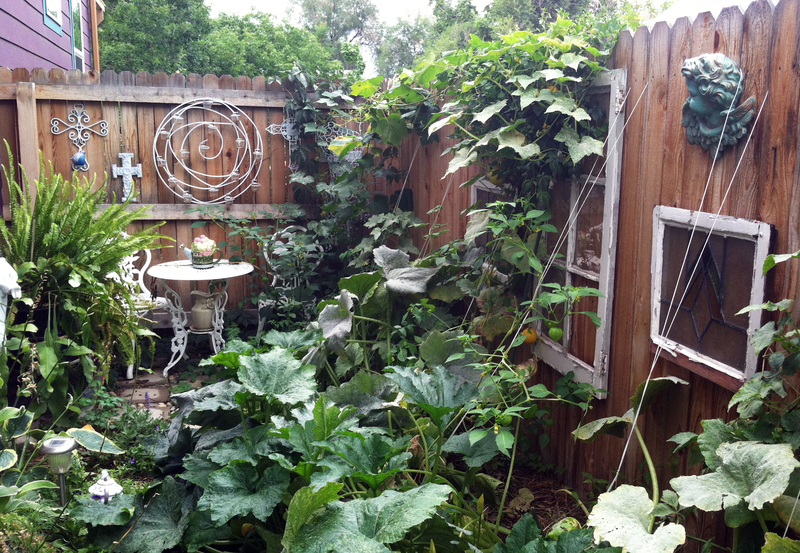 The yard is gently divided into different zones with creative fencing and edging. 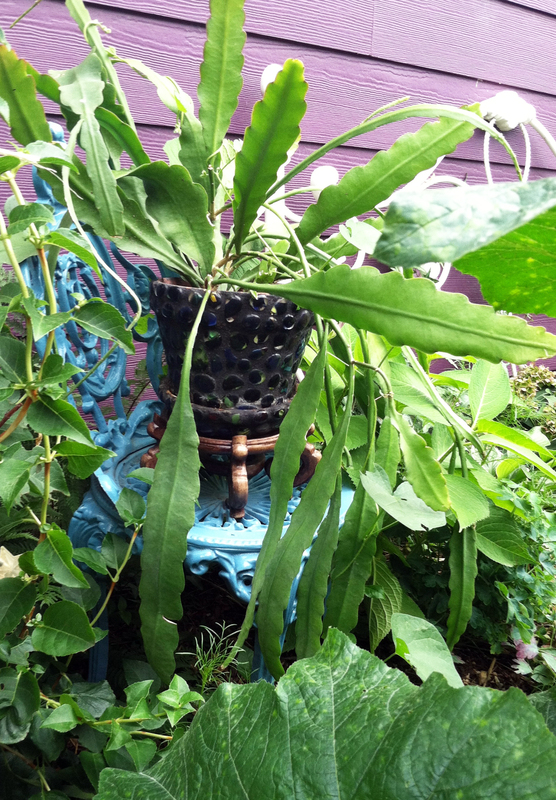 The Fairy Garden is on the North side of the house, with the entry marked by a curved arbor. 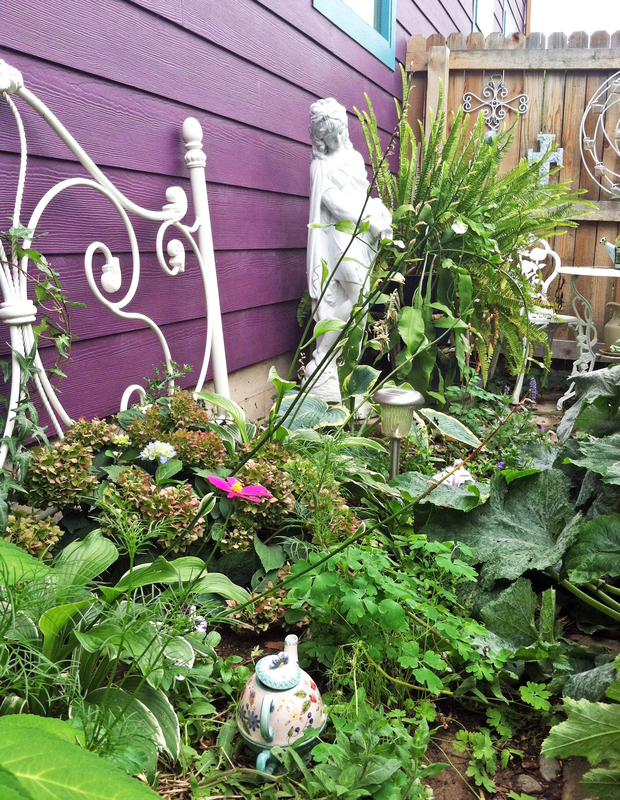 The Fairy Garden is a charming little space. 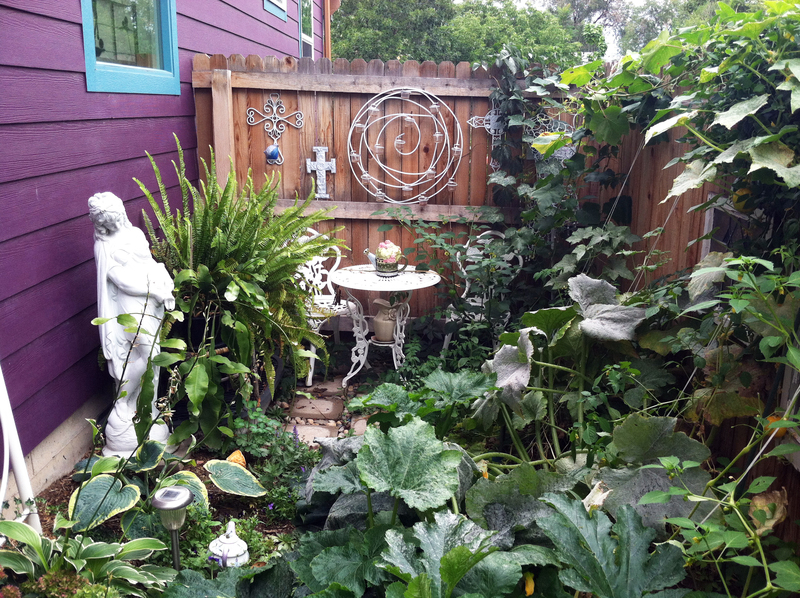 I love “Secret Garden” areas like this. 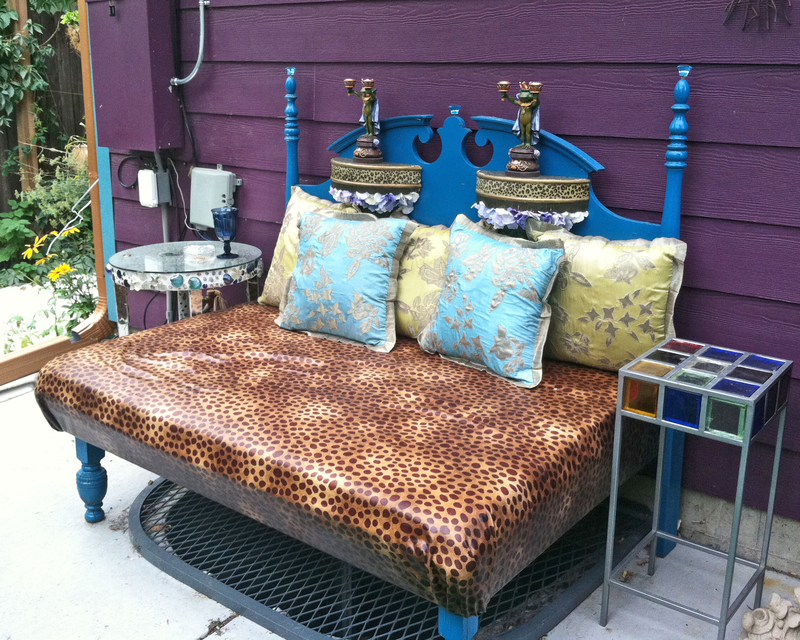 Some ideas to steal here are the metal headboard as a trellis, the old windows hung on the fence, and the old metal chair, painted blue and used as a plant stand. 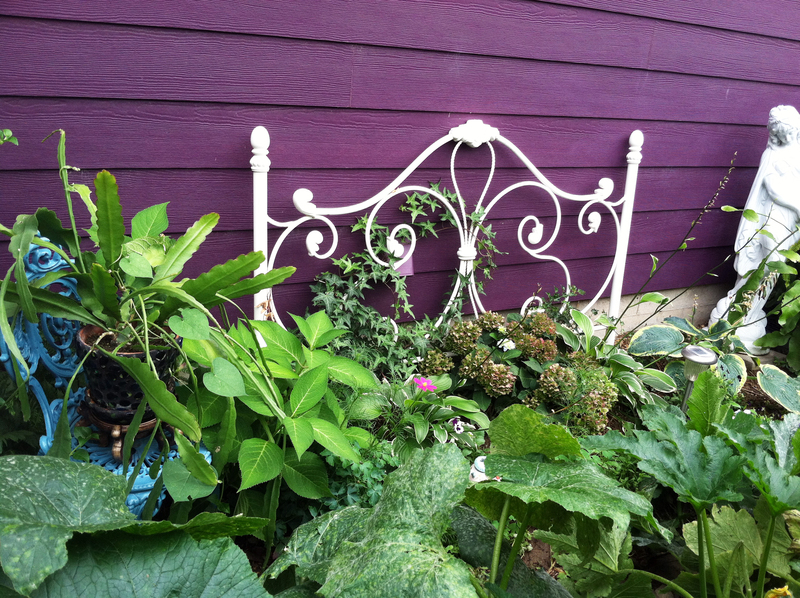 The big Idea to Steal on the porch is the seating made from an old headboard. The feet were cut off and became the front legs, a thick piece of wood was added for the seat, as was foam. The seat is covered in leopard print vinyl and attached with a staple gun. Decorative wall shelves have been added to the headboard. Love this one. 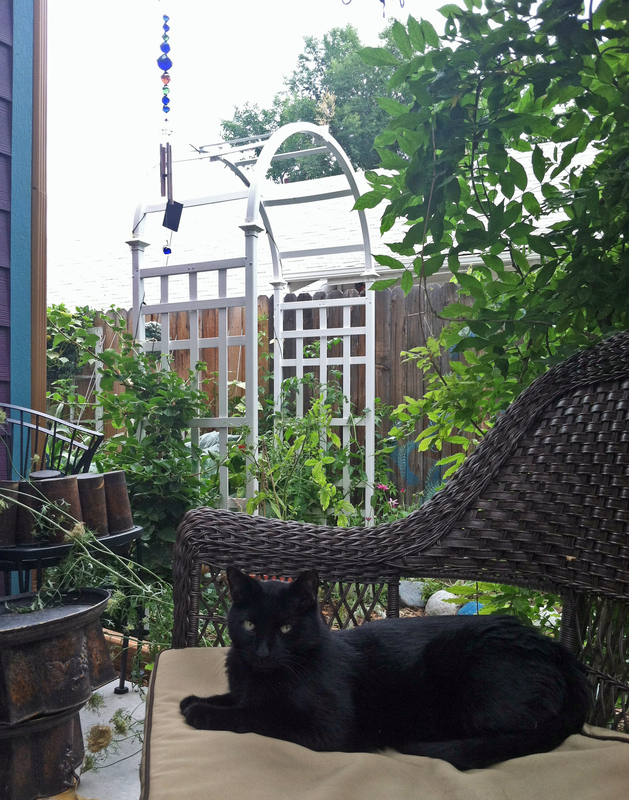 Wednesday we’ll explore the backyard further, stay tuned! 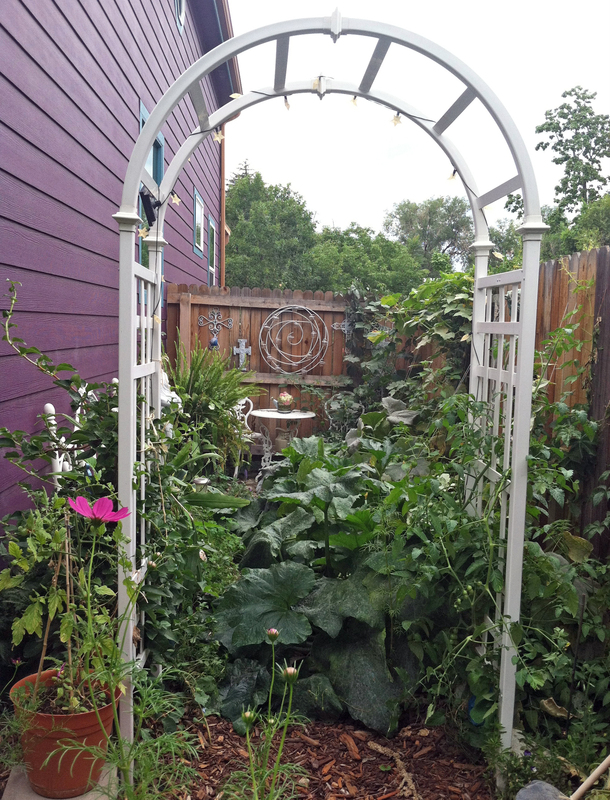 This entry was posted in decorating, Denver, DIY, gardening, home, plant care and tagged back porch, creative fencing, creative space, deadly nightshade, Denver, DIY, diy garden, ecclectic garden, fairy garden, garden, garden chair, garden ideas, headboard garden, headboard trellis, unusual garden. Bookmark the permalink.